A Challenging Compliment to Harbor Town. 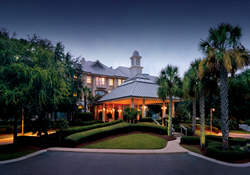 Sea Pines Resort has welcomed guests for more than 5o years. 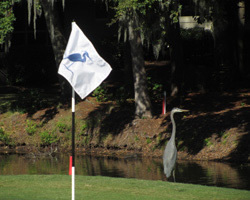 Many know it as the home to the PGA's RBC Heritage played at big sister harbor Town since 1969. The resort also features 2 other layouts, the Ocean Course and recently remodelled Heron Point by Pete Dye. Tight, tree-lined corridors and expansive bunkers and water hazzards present a formidable challenge. Typical of Pete Dye designs, steep fall-offs and long framing bunkers guide you to your targets. The hard part is execution and avoiding the big numbers. 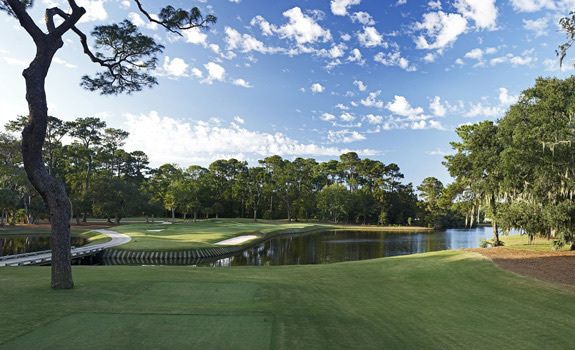 As part of the three courses at Sea Pines, Heron Point is not as well known as Harbor Town, but you will be inspired and challenged just the same. With a set of family tees playing 3700 yards, Heron Point is perfect for everyone on your vacation get-away. Par 72, 3699 - 7058 yards, 66.4 - 75.2 rating, 112 - 141 slope. With a collection of holes akin to Pete Dye's trademarks, difficult bunkers and sharp ridges place a premium on hitting the right shot to the right places. A pair of par 5's in the middle of teh round highlight the precision demanded at Heron Point. Hole 9 is a relatively short par 5 but plays longer than the number based on the difficult drive. You must hit to the corner of a sharp dog-leg left with a steep drop-off and deep nasty bunker grabbing a miss left. Your second shot must avoid the pond right on your way to the peninsula green set amid sand right and a collection area left. Another sharp dog leg left awaits at Hole 11, this time though a big drive is needed to get to the fairway over the pond and nasty bunker guarding the corner. Navigating the bunkers right and left on your approach gets you to the final destination.